Royale is owned by childhood friends chef Hass Bazzy and pharmacist partner Moe Ettaher. 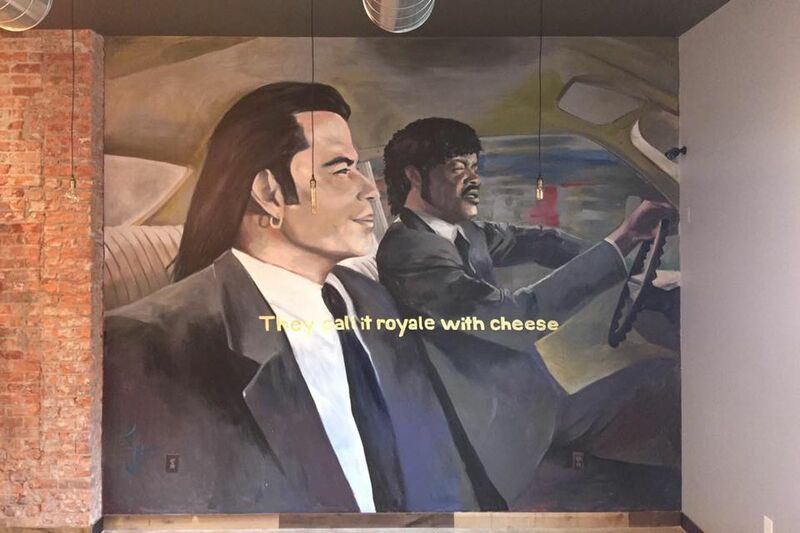 The pair were inspired to open their restaurant after watching a scene from Quentin Tarantino’s iconic 1994 film, Pulp Fiction, in which Vincent Vega (played by John Travolta) describes his experience ordering a Quarter Pounder with cheese in Paris, France, to Jules Winnfield (played by Samuel L. Jackson). The 2,000-square-foot space seats around 60 patrons inside with an additional 25 seats on the patio. The restaurant’s interior incorporates reclaimed wood with exposed brick and features an open kitchen with a fast-casual, counter service format. Diners can expect a creative menu that blends American and Mediterranean flavors. The restaurant’s namesake Royale burger is topped with smoked brisket, southwest corn relish, caramelized onions, avocado, smoked gouda, creamy coleslaw, and “Royale sauce” (a creamy, fondue-like cheese). There’s also a vegetarian falafel burger with tomatoes, romaine lettuce, Lebanese pickles, avocado, and lemon-tahini aioli. For a purely id-driven craving check out the deep-fried Doritos ravioli filled with jalapeno nacho cheese with roasted tomato sauce. Most importantly, the shakes feature house-made custard in flavors like Cinnamon Toast Crunch, Oreo-Nutella, and Hershey pie. Royale With Cheese is located at 4163 Cass Avenue; the restaurant is open from 11 a.m. to 9 p.m. Monday through Saturday and 2 p.m. to 9 p.m. on Sunday.